New England, ca. 1800. This very desirable subject elevates this piece considerably. 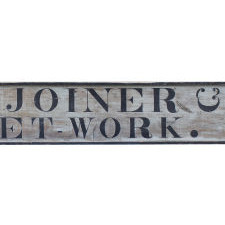 IMAGINE the woodwork and furniture discussed and produced by those passing under this sign. Single board with square nailed bold picture-frame molding. 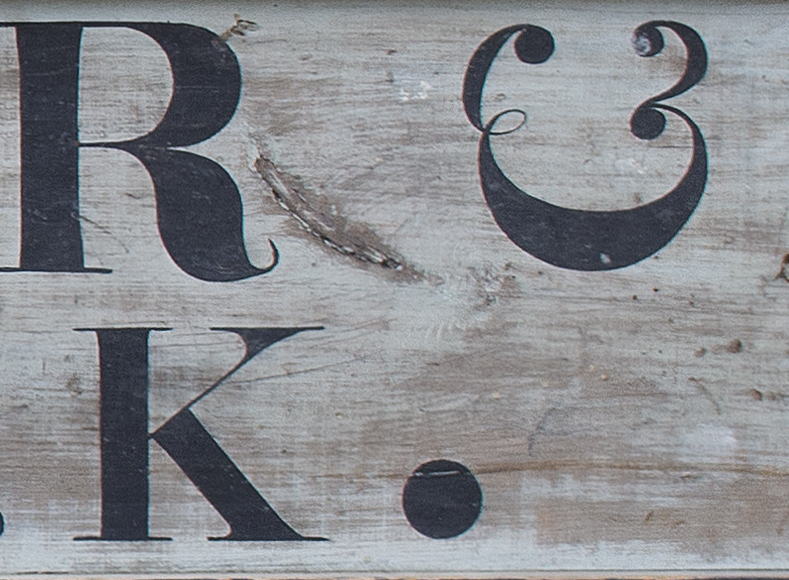 Dry, unvarnished original black lettering over patinated oyster-white, the lettering rendered by a professional painter. 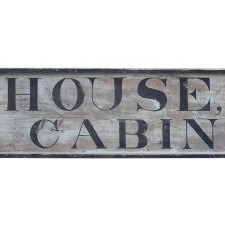 Note the early use of the "comma" after HOUSE, and the large "period" after WORK, punctuations seen on signage of this time. 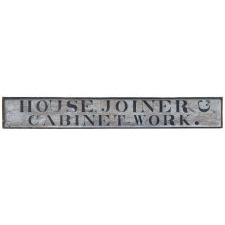 More skilled and precise than the "carpenter" (who built a home's structure), the "house-joiner" worked within the house, producing decorative moldings and trims, mantelpieces, window and door frames, and built-ins such as shelves and cabinets, while the cabinet maker referred to fine furniture. In excellent period condition with minor "checks" and old loss to just the facing of the end-moldings. The back-side was later over-painted (in the 19th century) with signage for Book Store and Medicines. It is likely that later usage and exposure of the books/medicines side protected that House Joiner/Cabinet side allowing it to survive....About 94 inches long x 13 3/4 tall x 2 3/8 deep (at the moldings). 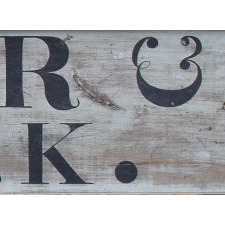 I see this sign as a treasure for the collector that honors the gifted craftsmen of 200-plus years ago that worked with their hands to produce furniture treasures and the interiors of the homes they were made for..